Welcome to my rants, essays, photos, etc., on a variety of subjects. Follow me to the country in my mind. It's 2:32 AM, and it's raining again, with thunder and lightning. Tuffy's hanging out next to my leg, pawing me in a bid for reassurance, and possibly dog biscuits. But there's only so much time I can spend scratching and talking to her right now. I need to get this done and go to bed. Foolishly (and when am I not foolish about time management? ), I watched the tv adaptation of one of my favorite books, A Wrinkle in Time tonight, for the second time ever. The first time was when it aired on ABC, a little over two years ago. I've had it on DVD for quite some time, but didn't remove the plastic strip that held the box shut until tonight. 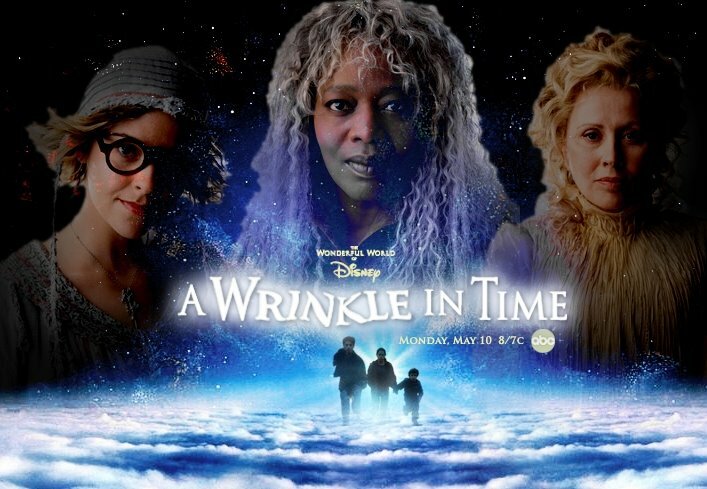 My main problem with this two-hour-plus tv movie/miniseries is that despite the director's and screenwriter's expressions of love for the book, hardly a word that Madeleine L'Engle wrote survives in their version of the story. First off, the first names of the Murry parents are different, which is somewhat understandable considering that their first names aren't mentioned until one of the sequels. Mrs. Which is a very different character from the book, and a bit of an obstacle to the children. Almost everything overtly religious in the book is gone, replaced by vague platitudes about joy and fighting evil. Odd new story elements are added, such as Mrs Whatsit taking the form of a crow, Mr. Jenkins getting Meg's first name wrong, kids on Camazotz trying to figure out whether they're required to go to a movie, and Charles Wallace playing cruel tricks on Meg under the influence of It. 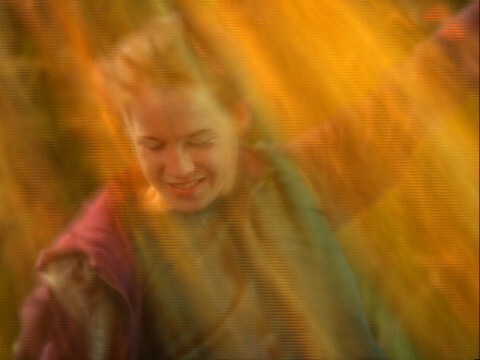 Worst of all, Meg manages to liberate an entire planet at the end of the movie. Yeah. Right. Nevertheless, I gave the movie another chance tonight, on the grounds that movies based on books are almost always "alternate universe" versions of the story. and must be taken on their own terms; and because I had the DVD out anyway to watch the L'Engle interview on it. One thing I will say for it: the three kids are perfectly cast. 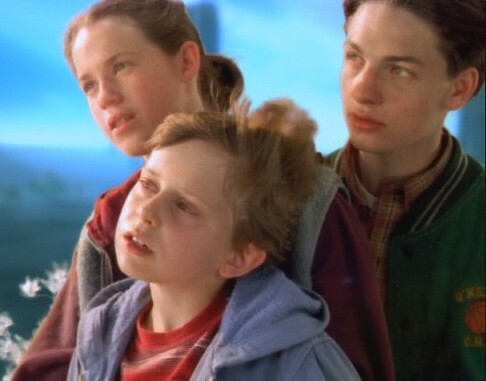 Were it up to me, Katie Stuart, Gregory Smith, and David Dorfman would still have played Meg, Calvin and Charles Wallace, but with a very different script. Even so, there are some good bits that the writer and director added that ring true emotionally. Meg gets a nice little flashback with her father at the star-watching rock, and her voiceover afterward is just about perfect. Meg's trouble at school works pretty well, also. My main quibble with her character is that she ought to have glasses, unruly hair and probably braces. Charles Wallace is a little too cocky, and a little too cruel toward the end. Calvin - well, Calvin's pretty much perfect. The other thing that bugs me is the tv movie stops about every twenty minutes for a long special effects sequence. Yes, I know these things are expensive, but dragging them out for a minute at a time is a waste of budget and storytelling. Still, overall, I didn't hate it. If bugged me, but I quite liked it in spots. 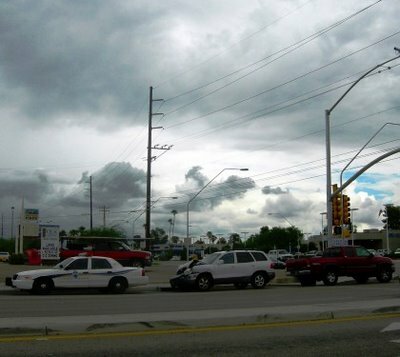 Early this afternoon I tried for a shot of weird clouds over the Rincon Mountains to the east. The Rincons proved to be invisible in the shot, but you can see the clouds - and the reains if an auto accident. Looking north toward the Catalinas, it's again a little hard to find the mountains bemeath or behind the clouds. Despite my ten hours of sleep, 6AM to 4PM, and the hours I spent researching Moochie, inner weasels and internet crackpots (Did you know that Tanya Harding is really Lee Harvey Oswald? So claims our next Pharoah. 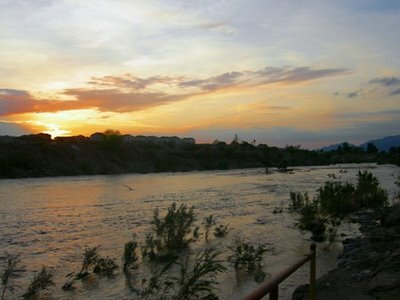 ), I did get out today to take about forty pictures in the wake of recent flooding around town. It "only" rained a little over an inch and a half near my house between midnight and 11 AM, but other places the NWS measured got over 3 inches. 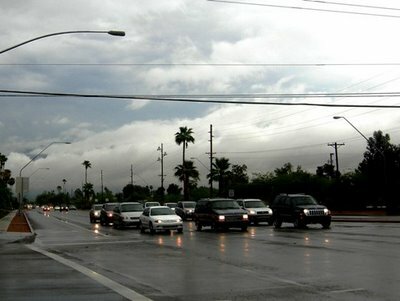 For those of you who might be keeping score at home, that means some parts of town got over 25% of Tucson's average annual rainfall - in 11 hours. It's pretty humid now, but overall we've had major relief from the heat as the monsoon finally took hold. And I think I just heard thunder again. The first stop on my photo shoot was the little wash behind the high school, the place with that blue bridge I showed you a week or two ago. The side with the bridge was already almost dry as of 6:30 PM Saturday, but on the other side of the street (E Calle Betelgeux), as seen from my car window here, it was still quite full of water, and rather beautiful. 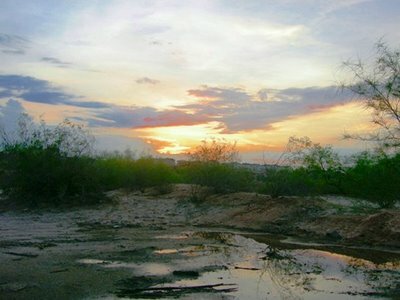 For the rest of my photo shoot, I went to one of my usual places for post-flooding pictures: Pantano Wash at 22nd Street. 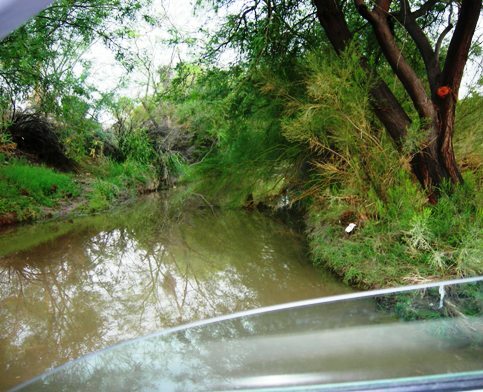 A "wash" is basically a riverbed that only has water in it after it rains, and sometimes not even then. As you look at these pictures, keep in mind that this "river" was probably dry less than a week ago. Notice that the line of bushes (or saplings - I'm not quite sure which) is all bent over in the direction of the flow of the floodwaters. The advantage of going late in the afternoon is that I was able to work sunset into some of the shots. I cheated the saturation on this one, but I like the way it came out. The line of condos or apartment buildings above the opposite bank looks like a fortification here rather than ticky-tacky housing. Here's another sunset shot with condos as ramparts, defending the west bank. 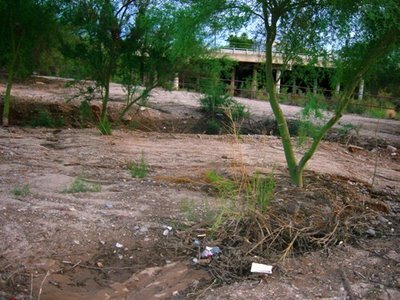 Flash flooding left behind gullies and debris in the empty lot next to the wash. The one in the background of this shot was probably four or five feet deep in spots. 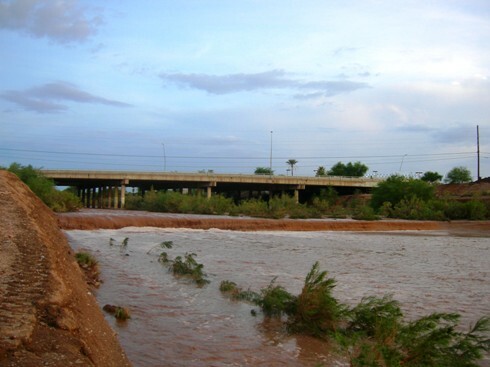 The palo verde trees in the path of the erosion seem to have taken the flooding in stride. I'm petty sure they put down deep roots to get to what little water is usually there, but they also take advantage of places that get water on a frequent basis. 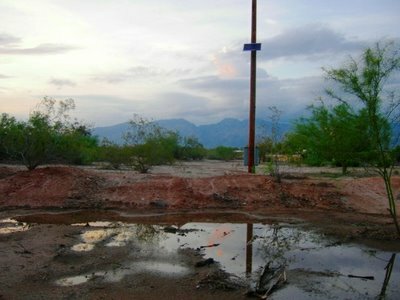 I'm trying to be selective here, but I can't resist showing you a couple more shots from the empty lot next to Pantano Wash. As you can see, it still had standing water in a couple of spots. 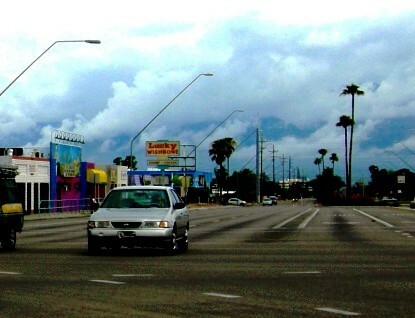 I like this picture because you can see the clouds just starting to build up again over the Catalinas. Yes, it has rained again since I took this picture. 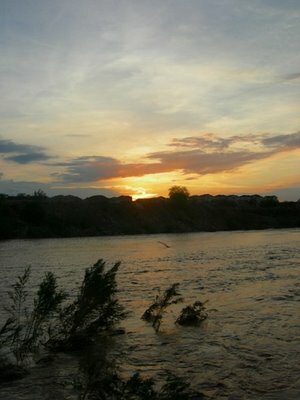 And here's sunset again, as seen from the empty lot. I did take some sunset pictures from my neighborhood afterward, but this will do for tonight. It's late, late, late, again. I'll catch up with other promised subjects Sunday night. A few of you, I'm sure, will know who Moochie is. The rest of you: bear with me. T his is Kevin Corcoran, otherwise known as Moochie. 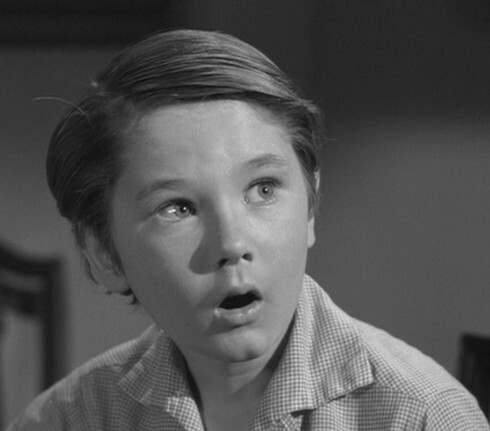 Born in 1949, he was a child actor for Disney in the late 1950s and early 1960s. I know him best from the second and third Spin and Marty serials on the Mickey Mouse Club, where Moochie was the littlest boy but just about the biggest handful at the Triple R Ranch. Before that, Kevin played a dairy farmer's son, Moochie McCandless, in another Mickey Mouse Club serial, Adventure in Dairyland, which I've never seen. Kevin played a different Moochie in the 1959 film The Shaggy Dog, and yet another Moochie, apparently, in Moochie of the Little League. My favorite bit in that one is when Moochie, having practiced switch-hitting against his manager's orders, steps up to the plate from the other side, connects with a ball - and proceeds to run clockwise instead of counterclockwise around the bases! 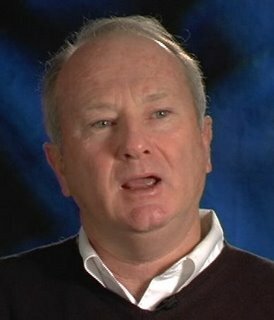 Kevin Corcoran also played Toby Tyler in the movie Toby Tyler (imagine that! ), co-starring two of my favorites from Zorro, Henry Calvin and Gilbert Shelton. Kevin also played Jimmy Bean in Pollyanna, another Disney film I like a lot, a member of the Swiss Family Robinson, and the younger brother in Old Yeller and its sequel. I tell you, the kid got around in those days! This is Kevin Corcoran as an adult, talking about The Shaggy Dog. He retired from acting around 1965 to 1968, and went to college. He later returned to show business, but not to acting. I didn't connect the name with Moochie until much later, but Corcoran was First Assistant Director on at least three episodes of Quantum Leap. He's been a producer on Murder, She Wrote, and on a lot of Disney stuff. Good for him! Why am I telling you all this? I wrote his Wikipedia article today, from scratch. I was shocked that Disney's once ubiquitous, irrepressible Moochie didn't even have an entry, despite his name appearing on a lot of Disney films that did have entries. There ya go, Kevin. I've tried to do well by you, one of my favorite kid actors. Nothing at all is happening with the Barbara Bauer article at the moment (a good thing), as everyone tries to resolve whether the Disemvoweling article is to be deleted entirely. People are mostly being polite in all the discussion and fact-finding, and since my initial few comments I've mostly stayed out of it. Five minutes ago it was raining heavily, and I'm hearing a lot of thunder now. John and I are both pleased at all the rain and cooler weather we'd have the last couple of days. I gather there's been flooding in the usual parts of town, but I haven't heard of any major disasters, just minor inconveniences. I've got a Writer's Weekly Question to do, but I'll hold it for Saturday night. Weekend Assignment Suggestion: Your Own Invention! Weekend Assignment #122: Offer your suggestions for Weekend Assignments during the month of August. You can suggest anything you like, of course. I find personally the best Weekend Assignments are unusual enough to make people think, but easy enough that anyone can participate. If there's something you'd like to be made into an assignment but I haven't brought it up, now's your chance to suggest it! It's time to introduce your great new invention to an admiring world. What is it called? What does it look, sound, smell or taste like? What does it do? Your "invention" can be as simple as a new dance step, or as ambitious as a solution to that pesky global warming problem. Assume you have everything you need (an army of researchers and marketing people, and a multimillion dollar budget, if necessary) to send your brainchild out into the world. Oh, and don't worry if it's just plain impossible. Extra Credit: Have you ever invented or created something in real life? I'm pleased to announce that MavaCo is now accepting preorders for my M-Box 3000 P.E.D., which will be available at Target and other fine stores in time for the Christmas shopping season. "P.E.D." stands for "Personal Empathy Device." What's that, you ask? Well, I'll tell you. Plug this into any computer, go online, and select any name in your address book, buddy list, IM window, blog comment window, etc. The M-Box will attempt to contact that person for you. If her or she is online, a window will pop up offering an empathy session between you and the designated person. If the person clicks "OK," a second window will open, displaying a query from the sender, such as "How do you feel about what happened last week?" The recipient can send the same query back to the sender, or type in a different one. When the recipient clicks "SEND," the M-Box will generate a weak empathy field in a three foot radius from each participant's hard drive. 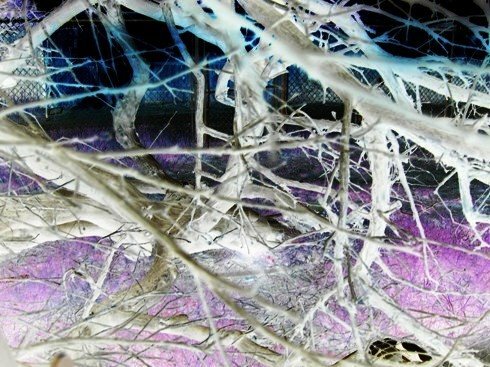 This targets several specific parts of the brain, and collects data about the user's cognitive and emotional reaction to the query subject. 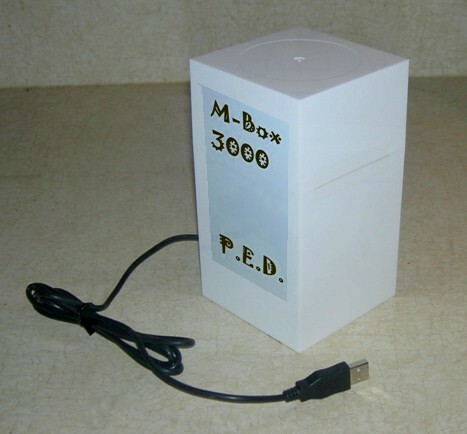 The M-Box then transmits the data into the other person's brain. In that instant, each person knows exactly how the other person feels, plus or minus an error margin of 10%. The entire process takes just thirty seconds (five minutes on dial-up, but during most of that time nothing happens), but the effects can last a lifetime. Now that you know how the other person feels about something, you're much more likely to sympathize, and treat the other person with compassion. Several major governments have already banned the M-Box in their countries. Incidentally, if I tell you what is really in that white box, I will probably engage your actual empathy. It contains the ashes of my second-ever dog, Noodle. 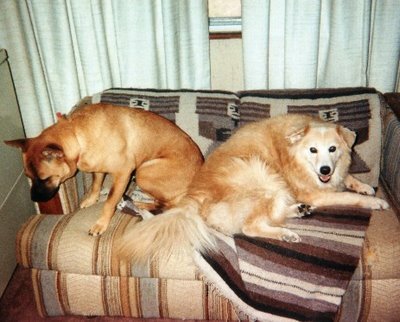 Now that Tuffy is ten years old and slowing down a bit, I'm starting to confront the fact that she won't live forever, either. Extra Credit: Aside from inventing the land of Mâvarin, the tengremen, Rani and Cathma and the rest, I once came up with a peanut butter and bologna sandwich with lettuce and mustard, which I ate for a couple of months before admitting that it tasted better without the peanut butter. The peanut butter and bologna weren't too bad together, but the peanut butter, lettuce and mustard really weren't compatible with each other. Note to Paul: What will I do for an entry if John uses this idea? Why, I'll "invent" something else, of course! 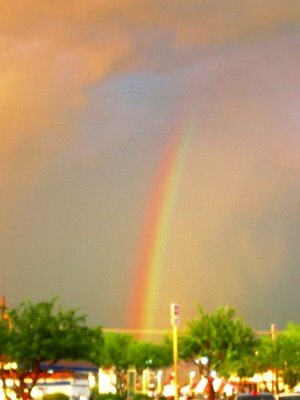 As I was griping last night about the lack of serious, cooling rain in the Old Pueblo, the weather was gearing up to give me my wish. It rained from a little before 3 AM to around 8:30 AM. The thermometer in my car said 73 degrees as I drove to work this morning, 86 as I drove home. That's a big improvement! 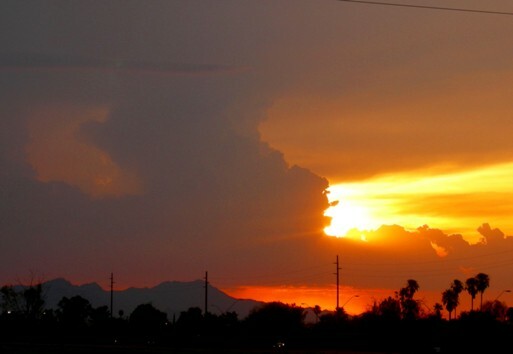 It was also one of those days when the Catalina Mountains disappear behind massive clouds. 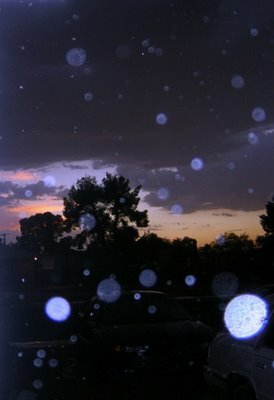 Finally, some dramatic monsoon pictures! On a normal day, there would be mountains in both of the shots above. Speaking of dramatic storms, it rained again about an hour ago, complete with thunder and lightning. 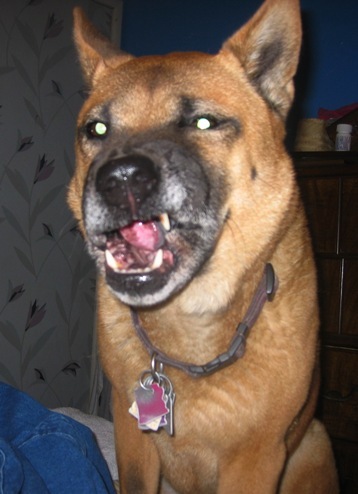 One crash of thunder was so loud and so close that it woke John, and set off neighborhood car alarms. There was no immediate indication of damage (not that I could tell from inside the house, well after dark! ), and the power stayed on. On my way home from the Kon Tiki last night, I noticed an extraordinary cloud formation that was part of the oncoming sunset. 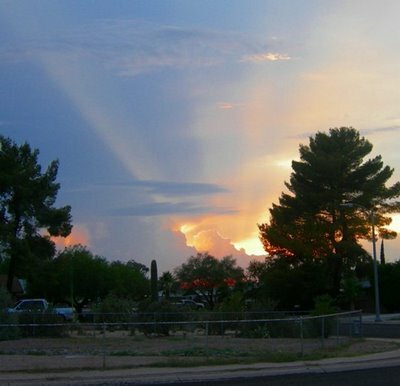 Even John, who gets bored with my frequent sunset photo shoots, urged me to take a picture of the view from our driveway. By then, I had already stopped at Safeway to take some pictures - and several more were to come after I left the house again for a trip to Subway. I boosted the saturation on a few of these (especially the one above), but they're a pretty accurate depiction of the real sky Tuesday night. Blue isn't a color one usually associates with sunsets. With all my griping lately about the 100+ degree days (me and the rest of the country), and my hot and humid office here at home, a couple of friends have said recently that they could never live in Tucson. On the other hand, at least one friend has expressed jealousy at all the great sunsets I get to photograph. Well, like pretty much everything in life, it's a tradeoff. Most people love Tucson weather in winter, early spring and late fall, and hate it from May through September. People who live here warn friends and relatives not to visit in July and August, but most folks know that anyway. Tucson's population swells in the winter with snowbirds and Gem Show attendees, and in March with the spring training crowd. In the summer, the hotels have special rates, which locals use to get away from the hot house and into a cool resort pool. 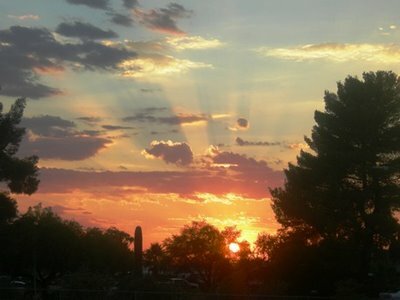 Tucsonans go on vacation in summer to San Diego and Colorado. Some spend the whole season somewhere else. Myself, I have to work, of course, and there are things I still enjoy here, even in July. Sunsets, for example. 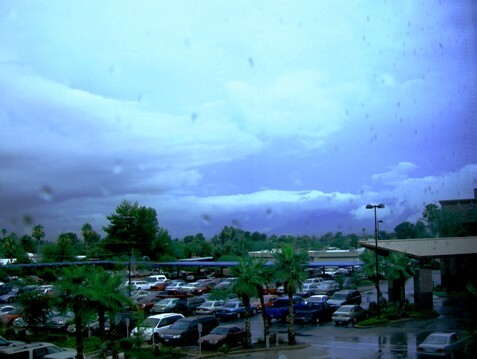 In theory, I should also be getting lots of monsoon pictures, of clouds and rain, rainbows and lightning. 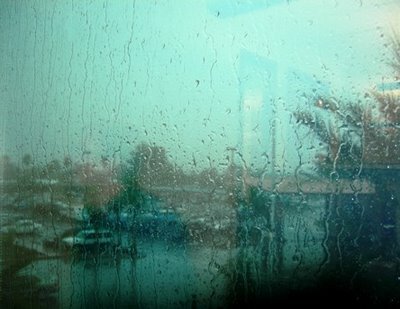 So far, though, the monsoon's been kind of a bust. It's rained, but mostly at night, or for ten minutes between 6 and 7 PM. "They say it never rains 'til after sundown...." With the weather we've been having, even a little humidity combines with the heat to make things muggy. And my camera doesn't seem to be capable of taking lightning photos, even if I knew exactly where and when to point the camera and press the shutter. Still, this is Tucson, where my church is, where the saguaros and ocotillos are, within sight of mountains in every direction. It's an awfully pretty place, at least at the edges. And in a few months, the summer heat will be over. A month or two after that, at least some of you folks will be shoveling snow, and jealous of your friend in Tucson. Speaking of summer in Tucson, I looked again today at the Wikipedia entry for Tucson's AAA baseball team, the Tucson Sidewinders. I keep going on about the Tucson Toros, which was the old name of the same team. They've been the Sidewinders since 1998, though. I should probably accept the name and move on. Anyway, whoever worked on the Sidewinders article before I did seems to have done so mostly to slam the team for changing its name, and for changing pretty much everything else at about the same time. 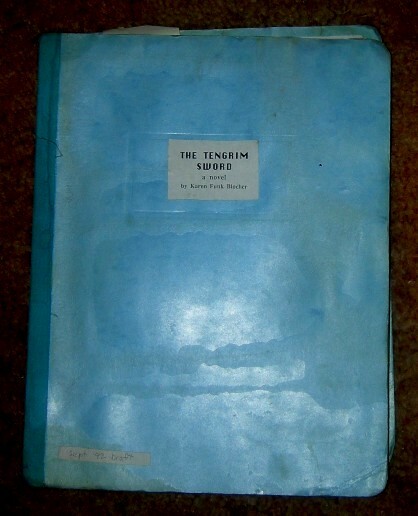 The Sidewinders and Toros articles were almost identical before I started messing around with them, each extolling the Toros and griping about the Sidewinders. I tried to tone down the criticism months ago, but when I looked at the Sidewinders entry today it was still far more emotional than factual. So I spent the evening researching the team's history online, and cleaning up the entry. I was able to add a timeline, correct the mascot's name, and get rid of most of the words that appealed to emotion instead of presenting facts. It's not perfect, but it's better now. One of the problems I had is that most of what I found online was from the Tucson Weekly. Their articles were usually about financial and political issues surrounding the team, not about whether they were playing well. In particular, the Weekly has reported many times about a deal between the team owner and the county that leaves taxpayers on the hook for some of the money the Sidewinders lose each year due to high costs and poor attendence. The daily papers are the ones that do the sports coverage, but I won't be paying a fee to download old articles for Wikipedia citations. I can get to the articles through the UoP online library subscriptions, but that doesn't give me citations that other people can use, unless they want to pay money or go to the physical library. I haven't been to a baseball game in a few years now, so I'm not remotely an expert on the Sidewinders as a team - who's been playing for them, who is managing, who's been called up and so on. I'm hoping someone will stop by the article and add stuff that actually has to do wth the game of baseball. Despite my lingering resentment over my lost Toros, and my boredom with a team whose players aren't even names to me, the Sidewinders deserve a decent Wikipedia article. With a 2006 win-loss record of 67-36 to date, they may end up having the best season in the history of Tucson baseball. Their Wikipedia entry, which is reproduced on Answers.com, QuickSeek.com and elsewhere, should be more than a pro-Toros gripefest. Maybe before the summer's out, I'll even go to a game. 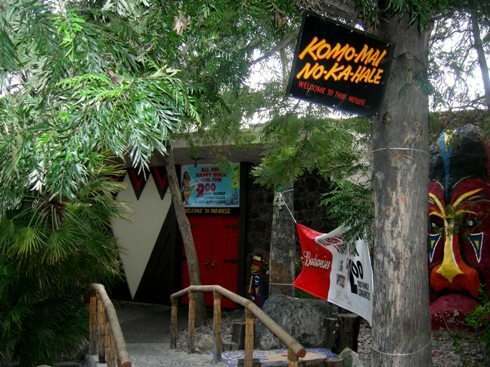 Round Robin: Aloha, Watering Hole! For this week's Round Robin Photo Challenge, "Ye Old Watering Hole" (suggested by Maryanne of Inside the Gilded Cage), I had several places in mind to feature, and trouble settling on one. At lunchtime on Tuesday, I decided to go to a local restaurant that makes its own ice cream, and to take pictures of ice cream sodas and such. Okay, so I should have asked first. Six pictures later, I was politely told to put the camera away. Their policy is that one can only take photos in the presence (and with the permission) of the general manager. So I left a message and talked to her on the phone later in the day. Her main concern is not to photograph customers without getting a release signed. I had tried hard not to take any pictures of customers, but reviewing them tonight I discovered that a one couple had accidentally made it into two of the shots. I tried cropping them out, but got stuck with someone's elbow. So I deleted those pictures entirely. That idea was a bust, but I'll go back sometime and do it properly. Meanwhile, I've got a fresh batch of pictures from one of my favorite places to eat and drink in Tucson, taken with permission from the staff. I've written about this vintage restaurant and bar before, both on my blogs and on Roadside America. The name of the place: Kon Tiki. Depending on who's dispensing the information,the Kon Tiki opened in either 1961 or 1962, but I think it was 1961. Hawaii was a new state then, and Polynesian culture and decor was all the rage on the mainland. 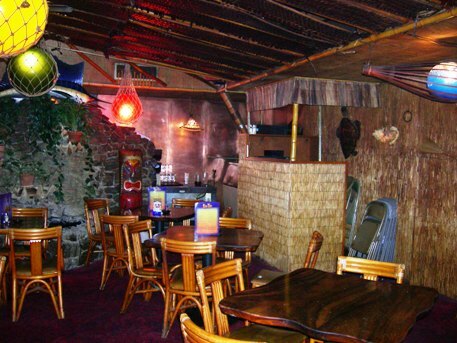 Over the years, Tucson's tribute to tikidom got to be a little shabby, as one might expect from 40-year-old thatch and wood and bamboo and matting. We loved the place anyway. One night a year or two ago, John and I sat in a part of the restaurant that was even darker than usual, because they were having electrical problems. While we ate dinner, which was great even if we could barely see it, a couple of guys were fixing a hanging lamp a few feet away. Things have improved a lot since then at the Kon Tiki. 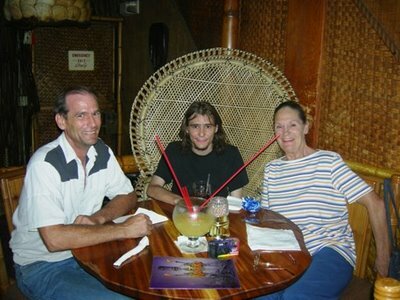 I read on someone else's blog tonight that the Kon Tiki was just refurbished. It didn't quite register with me while I was taking the photos, but I didn't see any any signs of shabbiness this time, except for one tiki that could use a little more paint. "Ace Jackalope" reports that the person who renovated the place for their April 2006 rededication was one "Bamboo Ben," grandson of Eli Hedley, the original interior designer of Kon Tiki. The koi in the little pond outside are still gone (and the tile-lined fake stream is dry), and the parrots are still missing from the aviary. But the rest of the Kon Tiki is looking better than it has in years. These nice folks, and the ones in the previous picture, agreed to let me photograph them and their family-sized drinks. I should have given them the info on where the pictures would be appearing, but I did disclose that it was for an online photo essay. 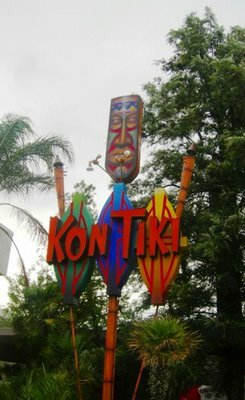 I can't give you a firsthand review of Kon Tiki's alcoholic beverages, because I stick to diet cola, ice tea and the occasional virgin pina colada. But the drinks menu is extensive, illustrated, and fun to read, with lots of colorful names for the concoctions. The drinks are also reputed to be inexpensive for what you get. Me, I care more about the coconut shrimp and the Polynesian barbecue ribs. And the decor. Always the decor. 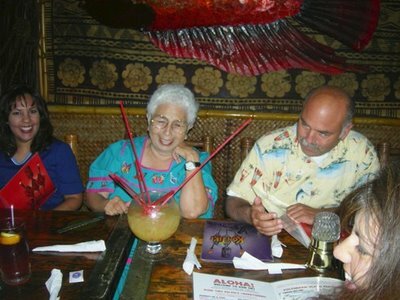 The Kon Tiki now has a flash web site. It's very cool and evocative, especially the intro. A lot of the bits aren't finished yet, but there is a photo gallery. I'm perversely pleased to report that like me, they have trouble getting good pictures of this deliberately underlit hideaway. For many years, the Kon Tiki used to sell tiki mugs that had the restaurant's name on them. We've bought a number of these at yard sales and antique malls, in a variety of colors. But since we started going to the place itself, there's been no merchandise in evidence - until tonight. Now they've got the classic mugs, scorpion bowls, tiki shot mugs, t-shirts, hats and visors. I bought John a scorpion bowl and one of the shot-glass sized tiki mugs. Got to reward the Kon Tiki for remembering their history, and doing it up right! Thanks, Maryanne, for an excuse to write about the Kon Tiki again. Now go see what everyone else is doing for this Challenge. And yes, you're welcome to join in yourself! Inside The Gilded Cage - Posted! New Suzanne R's Life - Posted! Julie's Web Journal - Posted! The Daily Warrior - Posted! First Digital Photos - Posted! Fond of Photography - Posted! Your Monday Photo Shoot: Get a picture of someone yawning and/or stretching. Clearly, pets are eligible for this photo shoot as well. 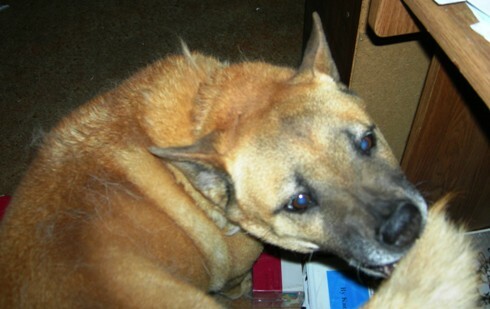 Tuffy stretching around to bite her tail. A photo from May. the loveseat, while Noodle hangs out. Circa 1997. Well, her mouth is open, anyway. October 2005. Tonight. She had no clue why I kept yawning at her. Now what? Also from tonight. There were more annoying and frustrating developments on the Wikipedia wrangle today. Barbara Bauer herself apparently complained to Wikipedia, and an admin took out even more of the entry, alleging that the sources weren't good enough, which is hooey. Ironically, one of the sections removed was the one about Barbara Bauer making threats and complaints about people who mention her online. There are times when irony and absurdity aren't very funny. This is one of them. I got some stuff done tonight, though. I kept up with the email on the Mavarin screen name, and finally cleared out the 74 emails on kfbofpql and the 17 on kfbuwot. I researched a minor financial matter, ordered a refill on the diuretic that actually works, and did laundry. I also opened my mag02 document to resume work on my Mages revision. Eight pages in, I don't think I've changed a word of it, but I haven't gotten to the troublesome part yet. Time has rushed me into tomorrow again before I'm ready; so I'll keep this brief. I got through the rest of the email on my main screen name. No, I'm not going to subject you to a blow-by-blow on the reading of the above. My 101-year-old friend Eva made it to church today for the first time in a month, alleviating my mild worry about her. She was her usual lively and chipper self. 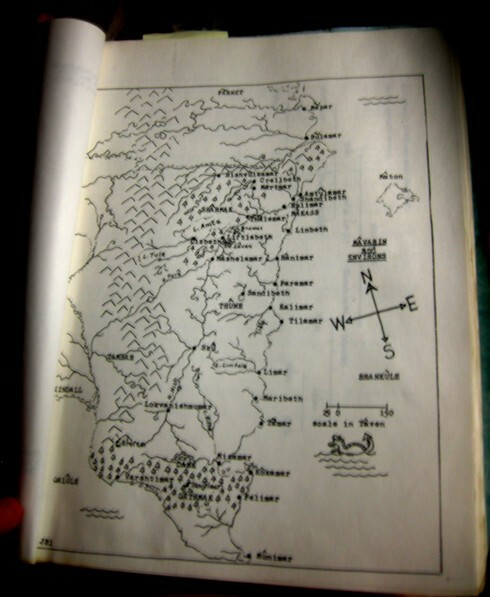 This is a copy of a map of Mâvarin that John drew for me a very long time ago, probably back in the late 1970s. I haven't seen the original in a decade or so, or any copy of this version of the map in several years at least. But tonight Sara asked me whether my first novel was still called The Tengrim Sword when she first read a draft of it in 1992. I remembered that I have a single-spaced printout from that era, either the same one that made the rounds of selected Prodigy Froods that year or a second copy thereof. I even knew approximately where it was. So I took it off the shelf, noted the title (still The Tengrim Sword at that point) and the date (September 1992), and reported back to Sara. Then I flipped a few pages and hooray! There was the map! Here is the September 1992 printout, in its decrepit old script binder. There are notes on many of the pages, long-since taken into consideration for subsequent drafts. When this was printed, a tengrem was still a "tengrim," a word John always hated because it reminded him of a shampoo for fighting psoriasis. Del was still named Dag, and John disliked that, too. Ultimately I changed it, not because of John, but because I came across one too many fantasy heroes named Dag, and wanted something that complemented the name Crel. 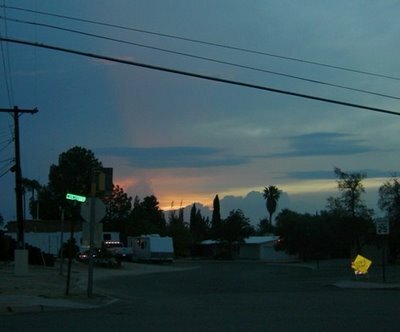 I missed the sunset photo tonight by a minute or two, but here's a dusk photo, as the rain started to come in. The overly-bright sign is my flash hitting a handicapped parking notice. I'm not going to go into the bad news too much tonight, but the Barbara Bauer/Disemvoweling wrangle just keeps getting larger and more rancorous, with more players entering the fray and certain people's positions and actions becoming more polarized. As ever, I keep trying to negotiate a settlement. I know that some of you wonder why I bother with all this sturm und drang over a woman few people have heard of (outside certain circles) and a forum moderation technique. I'll try to tell you; try not to laugh. It's kind of my ministry as a "cheesemaker." See, I often wonder whether I have any moral courage, whether I do the right thing when it's not easy or convenient, or just back down or stay quiet to avoid confrontation. I'm finding out that I do have some courage after all, even though confrontation upsets me greatly. I really believe in all that love thy neighbor stuff, in loving thy enemies, in being kind and fair. I also believe in disseminating information. My whole life is kind of founded on those two things: being nice to people and making peace if possible (even though I often fail) and synthesizing and spreading information, whether it's a sunset photo, a financial spreadsheet, an analysis of Diego de la Vega, Chapter Thirty-One of Mages, or Barbara Bauer's lack of results for her current clients. This Wikipedia situation pushes all my buttons, the ones about rationality and spreading knowledge as well as the ones about peacemaking, fairness and kindness. P.S. I'm about to empty my spam folder, but first I must report on the subject line from "npborerbqmi@appliedevidence.com." Subject: "sleepyhead first class." Yup, that's me! 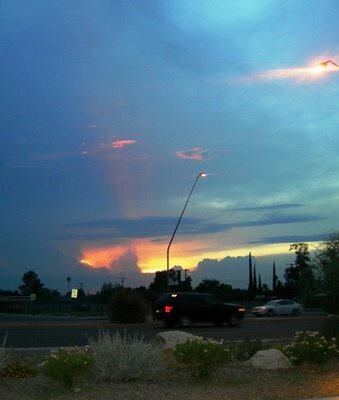 Tonight's photo is from tonight's sunset, taken when John and I ventured out to dinner. John teased me a little about "Karen's sunset blog," but you folks like them, and I like them, so what the heck? I went online pretty much as soon as I got up today, with the intention of reading through my email. Over nine hours later, I've whittled my in box from 81 items to 78. Why so little progress? Well, first of all, there's been more Wikipedia/Making Light stuff going on. Some of you may want an update, while others are probably sick to death of the subject. Let's just say that a few other people have been aiming salvos at each other, and I've attempted to edit the Barbara Bauer article yet again for fairness and accuracy. Some of the points to consider are a little esoteric, so I've had to explain them from time to time. Meanwhile, I mentioned that the person I quoted the other day had called me names and insulted me, and he left a note on my User talk:Mavarin page, claiming this was a fabrication. When I listed examples, he replied that they aren't ad hominem, even when calling me a troll. Uh-huh. And calling me fat and ugly isn't an insult if it's preceded by the word "if." That technicality didn't stop the Enterprise crew from slugging the Klingons in "The Trouble with Tribbles," and it doesn't wash with me, either. Other than that, though, I've been working my way through emails that languished precisely because they were likely to be time-consuming. The oldest one was an alert that a youngish blogger whose writing I like had a newer blog off AOL. I added it to my sidebar weeks ago, but I wanted to look around on it some more, and say something encouraging. Sad to say, she hasn't updated it much recently, so I threatened to move her listing to "Please Blog More." Let that be a lesson to all of you. The second email was the first of many FeedBlitz alerts. This one mentioned 9 new posts, but that was just the beginning, of course. When I play catch-up with FeedBlitz, I go to that blog (from my sidebar, not from the FeedBlitz email), and read from the post in the email up to the most recent one. Being three weeks behind, I actually had to hit the archives to read what I'd missed from Judith Heartsong, Patrick's Place, Presto Speaks! and Writer's Edge. It took an hour or two, but I'm caught up with those now, at least through sometime this afternoon or evening. I will be able to skip over them in the dozens more FeedBlitz emails I still need to go through. As I catch up on other blogs, I probably won't leave any comments unless I can't help myself; but at least I'll read what you wrote. In the last twenty years, we've seen many changes in how we write and how writing is perceived by the general public. Be creative (no stretch for any of you, I expect) and project what you think will happen in the next twenty years. When I was in college the second time, the University of Phoenix phased out textbooks in favor of e-texts. In some cases that worked, as when it was just a chapter, or some online interactive thing. My favorite of these was an economics one, where you decide whether to increase supply or raise tariffs or build housing or whatever, and the program shows you the result in your fictional country. I expect there will be more interactive media like that as time goes on. But the idea of replacing whole books with e-books is still a bad one. Unless you want to do all your reading at a computer, you're going to want some sort of hard copy. When you go to print out, though, you get the considerable expense of printing, on top of what you paid for the electronic texts, and Kinko's and such won't print it all all without written permission, which UoP failed to provide, at least while I was dealing with them. There has long been a dream of reading The Hitchhiker's Guide to the Galaxy on a PDA or somesuch, ideally "in the bath," as Douglas Adams envisioned it. But that little computer-like object, whether it's a PDA, a phone, an outgrowth of the iPod or all of the above, needs to be truly better than a printed book or a laptop before it will replace such things. I have trouble finding the right letters (and getting them to work) on my laptop as it is, because the printing on the keys has worn away, the spacing isn't quite the same as on a desktop computer, and sometimes I type the right letter and nothing happens. Trying to write a novel on a PDA, with keys so small that I need a stylus to press them, sounds like the opposite of fun. Until they overcome that problem, I'll be reading mostly paper books, and writing on a laptop (and getting annoyed whethever I try for an I and get an O). Next up, a post about the quiz, Which Action Hero Would You Be? My result was Neo. John watched that movie just today, but I still haven't seen it all the way through. The email after that is one of Chuck's quizzes. I took it already. Onward. 76 to go, as new emails keep appearing. Next, an AOL member satisfaction survey. I passed the deadline on it. Another FeedBlitz one. This one has three blogs I haven't caught up on yet. Two of them I've already read bits of pieces of, though. Done. 74 to go. And Sara, far more productive than I, has sent me more of her re-written chapter, which is many pages longer than it was two nights ago. Three AOL Alerts I didn't want to deal with at the time, quickly blitzed through now. Open the journal, read quickly, no comment. Delete email. Another FeedBlitz. Nothing I haven't seen. Delete. Oh, drat. I meant to keep that. FeedBlitz is my backup for my own posts. Restored it. Another FeedBlitz. Nothing new. Three more AOL Alerts. Down to 66. FeedBlitz. 65.
iTunes New Music Tuesday. The only reason I didn't delete it unread is that the header mentioned Dr. Seuss. Read and deleted. 64. A Disney thing Becky sent me. Okay, I just crashed AOL. No, it reappeared when I clicked the AOL icon. Must be a RAM/Explorer problem. But Disney wants me to log in. I know I'm registered, but my two attempts to log in fail. Oh, well. Watermelon and another can of Diet Orange Crush fortify me for the next batch of AOL Alerts. I'm glad now that I went out earlier for 48 cans of soda, a bottle of Diet Mountain Dew for John's immediate use, and four Diet Snapples. John's been working on the library shelving today. Hooray! It's midnight now, though (exactly), and he's long-since gone to bed. Downloaded a thing from an author interview. At least, I'm trying to do so. Five minutes later: I gave up on it. A Writer's Digest contest. Delete. 58. This is a lot of work! RoadsideAmerica.com sightings. There's hours of fun to be had there, and I have stuff to contribute, too. Not gonna do it now. Taking it off new mail, but I'm not deleting it. Borders. For once it lists a book I actually might like. Two or three, even. More FeedBlitz and AOL. Survey: Tell Us About Your Automobiles. I prefer not to - but I'll tell you folks that the driver's side interior door handle is starting to break on mine. More FeedBlitz and AOL. 51. AOL has disappeared from my screen again and refuses to reappear, so I read the rest of Sara's chapter (great stuff!) and quit Word. Now I can get AOL to work again. Hooray! I've made it to the next Writer's Weekly Question! What is your experience with characters? Do they come to you "full grown out of oblivion" or do they come in pieces and only share a bit of what you need to know them? Do you hear their voices, or do you develop them? What makes them real for you? Hmm. Considering that most of my characters have been hanging around for a decade or two or three, I'm not sure of my answer here. I guess for me, a character usually walks in and says or does something, and thus reveals a lot about himself or herself right away. I don't quite hear dialogue, but I have a good sense of the pattern of it, and the personality behind it. I do learn more about the characters as they continue to say and do things, but I think usually I know a lot about them pretty quickly. I may not know what they look like, or their favorite color, unimportant stuff like that; but I know their attitudes about things, and probably a good bit of background. The one exception I can think of offhand is Wil Masan, the Commander of the Palace Guard. He wasn't all that interesting when he first turned up at the end of Heirs, but in Mages he revealed himself to be a clever and complex man of somewhat dubious integrity. Aside from Jace and Sandy (D'Oh! I promised to do that tonight, too!) , and the Dewitt versions of my Mâvarin characters, my most recent new major characters are probably Keni and Tod Tarso. About five years ago, I had an idea for a scene in which Rani finds out he's done something horrendous, and it pretty much traumatized for the rest of his life. The necessary precursor to that scene was Rani killing someone, an innocent. So I came up with this character whose sole purpose was to be killed. I named him Keni, for obvious reasons. But then Keni opened his mouth, and said and did such interesting things that neither Rani nor I could kill him - or his slightly less winsome brother Tod, either. I probably knew within a week of his creation that Keni had to live. And as I go to bed, much later than intended, the email count stands at 38. Weekend Assignment #121: Do whatever you want, so long as it somehow involves the number 11. Memories of being eleven, lists that have eleven positions on them, collections of eleven similar objects -- hey, whatever you want. As long as the number eleven is somehow involved, it's all good. For those of you thinking about being sneaking and using binary notation: no "11, base 2." We're talking binary number 1011 here, pal. Firefox browser, with seven tabs open. One of those tabs is where I'm typing these words. The others have to do with stuff that I don't want to discuss here yet again. "Falkus9" - a Word document containing 10 pages, 6,087 words of a completely revamped first chapter of Sara's novel. It's actively good writing, too. "blog backups" - a folder containing all those backup documents Barbara sent me. Microsoft Office Picture Manager - on which I hope to find something at least metaphorically related to the subject at hand. AOL - Weekend Assignment #121: This One Goes To Eleven! Of course. AOL - Buddy List. Seems quiet at the moment. AOL - Email, with the header, "Karen, I just now caught up on your." It awaits my thoughtful reply. AOL - IM window to Sara, with the sidebar open for receiving the Falkus9 file. AOL - IM window from Carly from I think a few days ago. AOL - AOL Channels - the thing that pops up when you close the Welcome screen. I hardly ever use it. AOL - Mavarin's Mailbox. This currently has 66 emails marked unread, down from 80 earlier tonight. Every day I get a little farther behind. This weekend I will catch up - this time for sure. Extra credit: Grab a book, open it to page 11, and write out the 11th sentence. She was doing this at the same time that she was scraping carrots, so the carrot scraper was a scalpel as well as a scraper. --Vicky Austin, describing her sister Suzy's doll appendectomy, in Meet the Austins by Madeleine L'Engle. "Two of my books for children were rejected for reasons which would be considered absurd today. Publisher after publisher turned down Meet the Austins because it begins with a death." 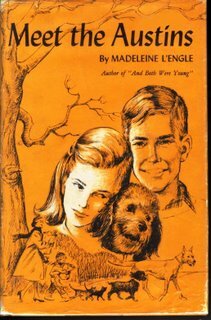 The other book that kept getting turned down was her most famous, most award-winning book ever, A Wrinkle in Time. But back to Meet the Austins. It begins with a news that a pilot, a friend of the family, has died in a plane crash. His co-pilot is also killed, leaving behind a 10-year-old girl, Maggy, who moves in with the Austins and drives most of the plot. 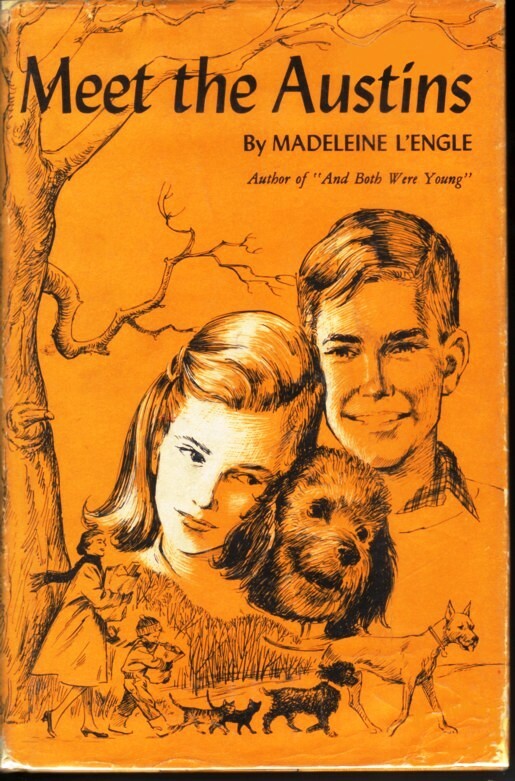 It's hard to imagine it now, but the idea then was that kids wouldn't be able to handle the idea of a child being suddenly orphaned in Chapter One. Hey, what about Oliver Twist, folks? There are lots of orphans in books that children read. There was one more weird, controversial thing about Meet the Austins, that led to the book coming out with a chapter missing, not to see the light of day until 20 years later. 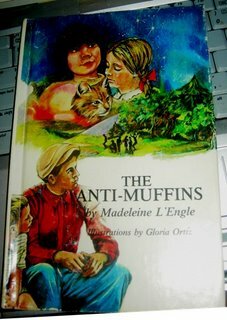 It was called The Anti-Muffins. It was about a fight at Sunday School, and a club the kids had, based on an incident when a cat had her kittens in the oven. The idea was that the kittens weren't muffins just because they came from the oven, or all alike like muffins. And if this anti-conformity, be-who-you-are, don't-judge-by-appearances concept wasn't clear enough on its own, it was driven home further by one of the kids in the club, Pedro, being the son of a tenant farmer. Apparently that was too much for The Viking Press in 1960 - but in 1997, Farrar, Straus & Giroux, the same publisher that decades earler took a chance on A Wrinkle in Time, restored "The Anti-Muffins" to Meet the Austins. Tonight was more fun than last night, but less productive. 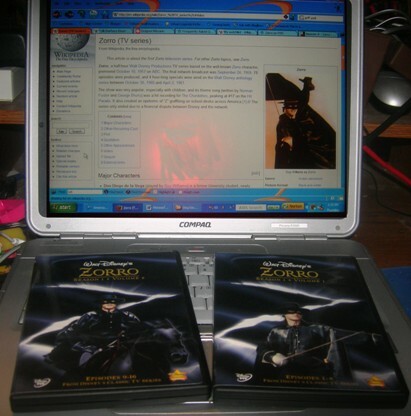 Our Zorro DVDs arrived from the Disney Movie Club, and I spent most of the evening watching the first eight episodes. They aren't the greatest DVDs ever. They offer only the 1992 colorized version of the show, and leave off in the middle of a story arc -16 episodes into a 39 episode season, 3 episodes into a 13 episode serial. They have no extras at all, and one of the boxes has Zorro's white horse from Season 2, Phantom, colored black to look like his other horse, Tornado! I love it anyway. This was a great show, and the stories really hold up. The colorization was probably state of the art for 1992, and makes for agreeable eye candy. Would Don Alejandro really have worn a bright orange outfit? Who cares? I love bright colors. So of course I had to edit the Wikipedia Zorro (TV Series) article, adding info on the DVDs and some other stuff. I ended up writting to Bill Cotter, who has a huge Zorro web site with all kinds of neat stuff on it. Cotter also wrote a book about the history of Disney tv, The Wonderful World of Disney Television, kind of a concordance and encyclopedia about everything from Zorro and Mickey Mouse Club to Duck Tales and Lizzy McGuire. I've used his book extensively, especially back when the Disney Channel was still showing lots of the old stuff on Vault Disney. The other thing I did all night was download a bunch of huge Word files that Barbara (BeckerB6) kindly sent me, backing up Musings from Mâvarin. Thanks, Barbara! What a lot of work that must have been! 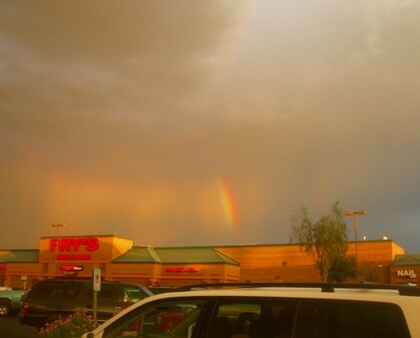 Before all the fun and games relating to Zorro the fox, I made a run to Subway after work, just in time to see two ends of a somewhat weak rainbow. They didn't really photograph well, but ever since the time I saw a really great, full double rainbow and didn't have a camera with me, I've tried to always take pictures of rainbows when I see them. Here are a couple of the better shots, with the saturation boosted and other adulterations. Really, the camera wasn't quite up to reproducing what my eyes saw, or else I haven't found the right setting yet. After Subway, back at the house, I took a couple of sunset pictures. They're unusual in the contrast of light and dark, which is pretty much how the sky really was. 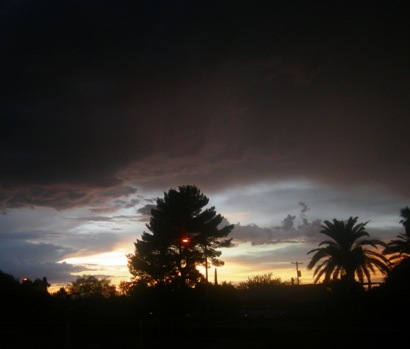 In the other direction it was a solid blue-gray of clouds, occasionally shot through with lightning. I tried to luck onto a lightning shot, but even the photo that I'm sure was exposed before, during and after a lightning strike shows nothing but cloud. Ah, well. There was a little further unpleasantness today relating to that other matter on Wikipedia, but I mostly stayed out of it. I can knock a few more tasks off my mental checklist, at least for now. The church Schedule page is caught up, and I posted three entries(!) to the church news blog. I even answered a stressful email. Both of you [Karen and Jules] are blog comment commandos out to get Bauer in this attack piece. Your leader is Neilsen Hayden. You came from her group. That is far from objective. That's the conflict of interest and i hope that is perfectly clear. It has been my assertion all along before you directed respnses as an attack on me. This article makes a joke out of Wikipedia and you two attack an edit that you don't like indefense of your sci-fi hero editor. This is a cult. This is despite the fact that I added much of the positive material about Bauer to the article, such as her PhD and thesis, her singing career, and the evidence (weak though it is) that she actually has sold books for her clients in decades past. And the edit we didn't like was an anonymous one that attacked Teresa Nielsen Hayden (note spelling) without citing any sources. Nevertheless, to be fair, we investigated the charges it contained, which is more than the person quoted above seemingly did. Anyway, I think the wrangle over that article and the other one is over. Then again, I've thought so before, and been proven wrong. Everyone seems to be complaining about the heat these days, no matter where they live. 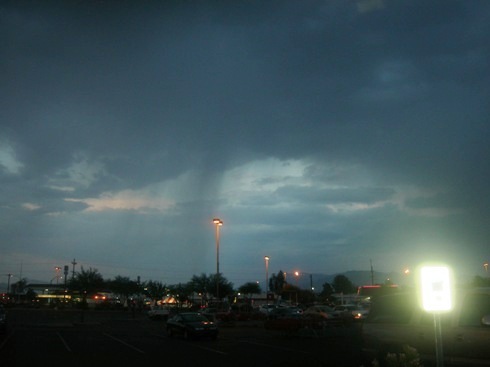 Here in Tucson it's been hot, of course, but we have been getting some monsoon rain, finally. I'm posting a couple of random pictures to commemorate that fact. Where did the mountains go? And maybe tomorrow night, Jace and Sandy will finally exchange emails again. I'm quite interested to find out what they've each been up to all this time. Negativity, Or, I've got a Dog and Her Name is Blue! 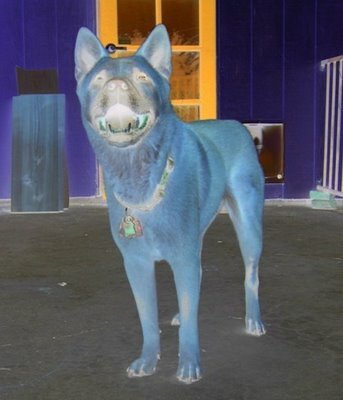 Your Monday Photo Shoot: With photo editing tools, take a picture of yours and turn it into a negative. The idea here is not to take just any picture, mind you, but one that you think will look particularly striking with its colors inverted. To save myself time and trouble, I've confined myself to the pictures in my July 06 folder. All of the ones I chose have appeared on this blog recently. 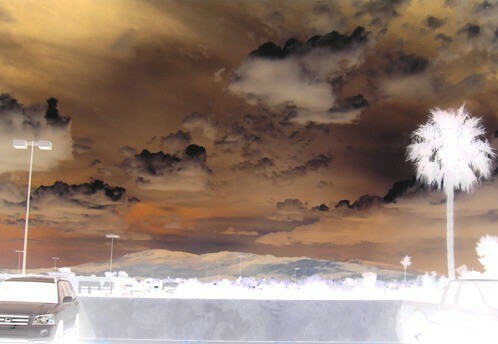 I took the posted version of each, and applied the "negative" command in PhotoStudio 2000. Let's take a look, shall we? Here's one of Sunday's mountains-and-clouds shots from the roof of the Park Place Mall covered parking. I didn't do anything to this one except click the "negative" menu command. 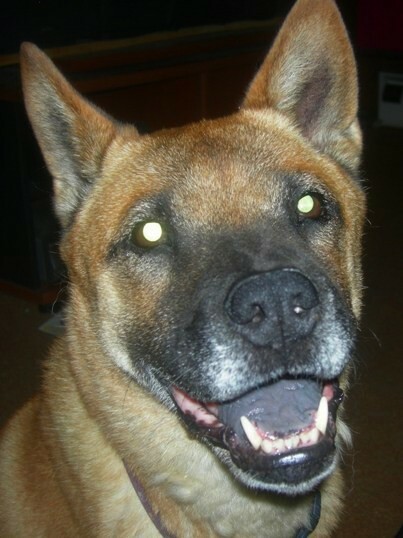 And here's Tuffy! This shot reminds me of a folk song Peter, Paul & Mary used to sing as part of of a rock and roll satire: "I've got a dog, and his name is Blue/I bet you five dollars he's a good dog, too!" Well, in this case, her name isn't Blue, but she looks like it could be her name. 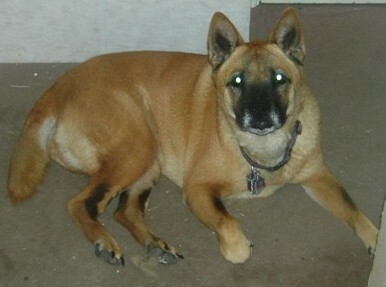 And yes, she's a good dog, too! For this picture of part of our downed tree, I did an autocorrect and darkened it a bit. 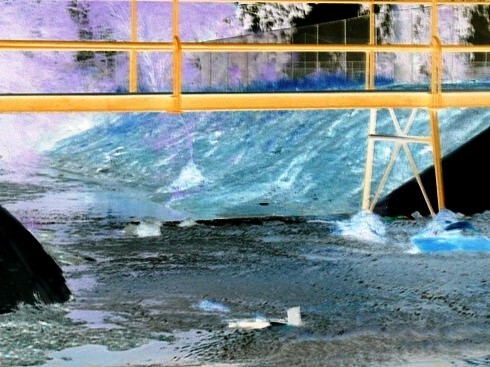 Funny how the water in the wash near the local high school ends up blue as a negative. This one got an autocorrect, but that's all. I like the yellow bridge, too. Tonight I worked a little late, bought us some dinner, and then blew most of the evening on another Wikipedia trauma, which involved the same two articles as all the previous Wikipedia traumas. The nastiness and negativity from one of the participants really gets me down, but I can't ethically back away. The good news is that the issue seems to be settled on one of the articles, and the other one may soon follow, I hope I hope! Since then, I've been working on this entry, and trying to whittle away at my email. I've gotten it down from 60-something emails to 47, mostly by reading my AOL alerts. When I finally get through all of those, sometimes this week I hope, I'll tackle the FeedBlitz alerts for all the non-AOL blogs I read. No late night blogging tonight! I intend to sleep! Author of magazine articles, trading cards, and the Mâvarin novels. Intermittently seeking an agent and a publisher. Accountant, church webmaster, ex-fanzine editor. Married since 1979, one husband, no kids, two dogs, no cats. Email is mavarin2 at gmail.com. Home is Casa Blocher, better known as The Museum of the Weird. Welcome! And worlds of our design. And what may be divine. damstevens:You don’t need a king. Any knight can make another... - damstevens: You don’t need a king. Any knight can make another knight. I’ll prove it. Kneel, Lady Brienne. that this blog is 99.9% cat free! Are You the Heroine, Or the Villainess? This is No Time to be Writing this Entry.